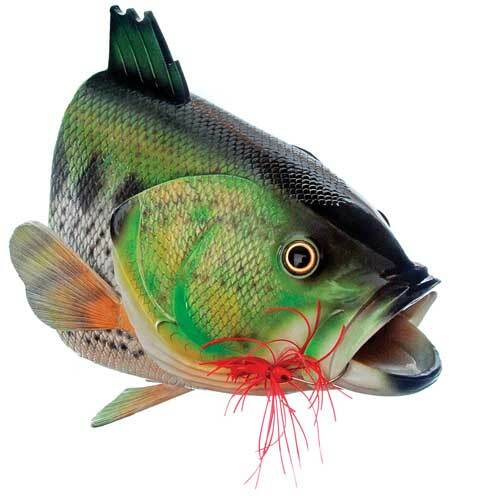 This fully functional large mouth bass bird house features beautiful, hand painted detailing and makes the perfect backyard addition for any fisherman or nature lover! Does not include predator perches. Can either be hung or wall mounted. This fully functional bird house features hand painted detailing with a unique Hiking Boot design that's sure to draw attention from both human onlookers and avian backyard inhabitants alike! Dimensions: 11" x 8.75" x 6"
A perfect gift for the hunting outdoors man who also likes to watch birds, humans at least will enjoy the irony of this gun shell design bird house! 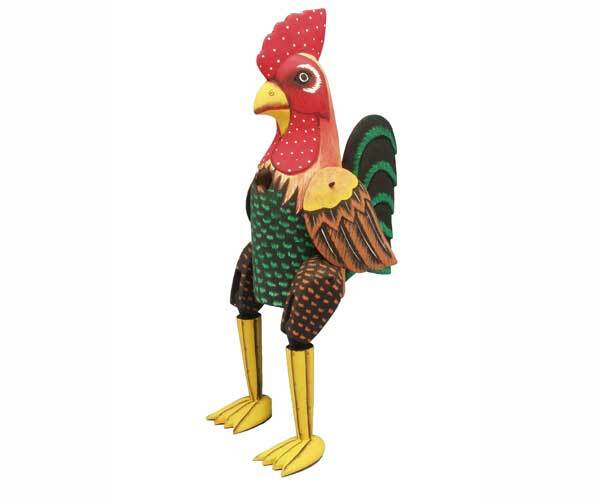 Dimensions: 11.75" x 6.25" x 6.25"
This hand crafted rooster birdhouse makes an excellent gift! Bobbo's handed crafted Albesia wood birdhouses are a safe environment for our feather friends. 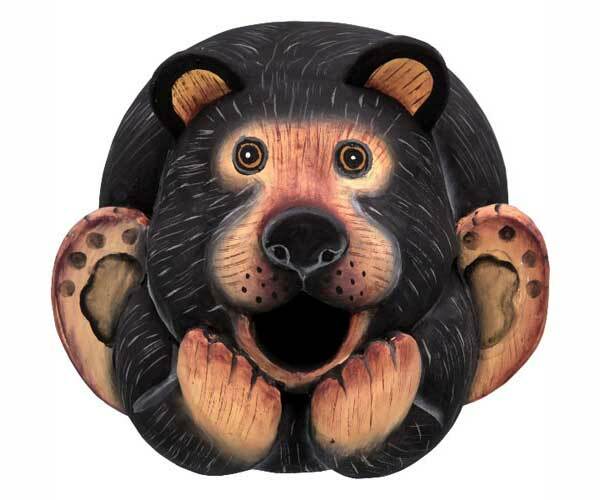 Dimensions: 20" x 6.7" x 7.50"
This adorable, hand crafted birdhouse depicts a cute black bear, making it the perfect, functional backyard decoration! Dimensions: 6.6" x 5.7" x 8.4"
This adorable, hand crafted birdhouse depicts a fifth wheel trailer and makes the perfect birdhouse decoration for those who enjoy traveling around in their trailers for long periods of time. 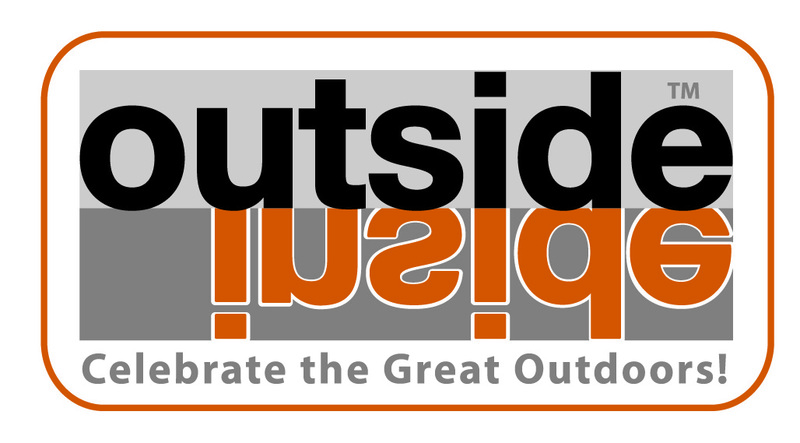 It also makes an excellent gift for the backyard of the travel trailer and bird watching enthusiast! 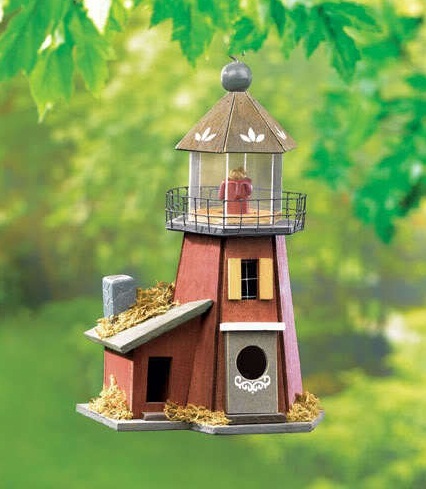 Dimensions: 12" x 4.7" x 5.9"
This cozy, Lighthouse theme wooden bird house features a plexiglass window and simulated candle! 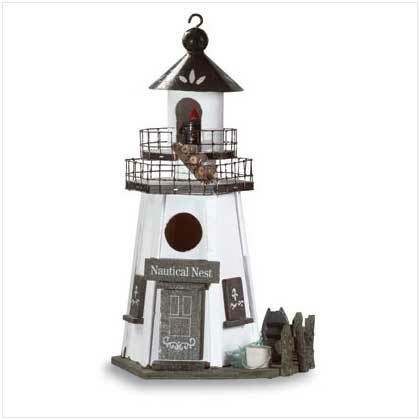 This adorable wooden light house bird house features a two-tiered walk and authentic nautical accents! 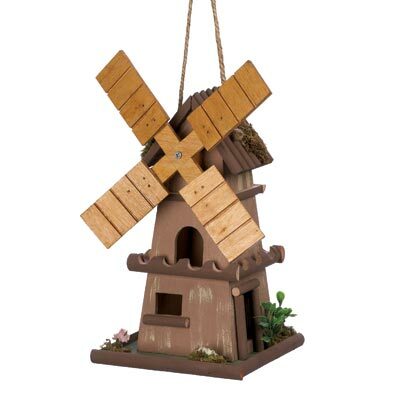 Crafted from natural wood, this delightful decoration is a cozy haven for your winged garden visitors! 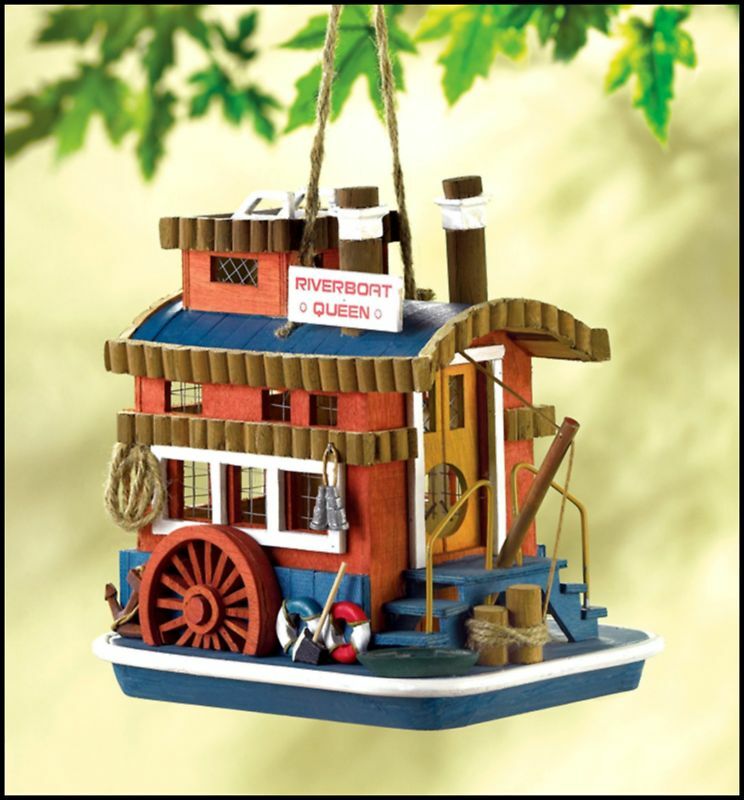 Nostalgically fashioned after old-time paddleboats, this beautifully detailed birdhouse brings the carefree air of the Old Mississippi River to your backyard! 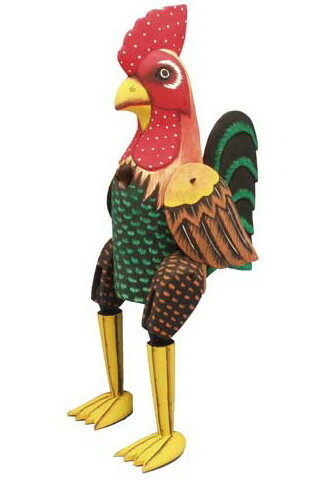 This beautiful collection of bird houses is perfect for gift giving or the true bird enthusiast with a large backyard! This gift assortment is perfect for corporate gift giving or for the family that loves nature-8 gifts at only $38 each! 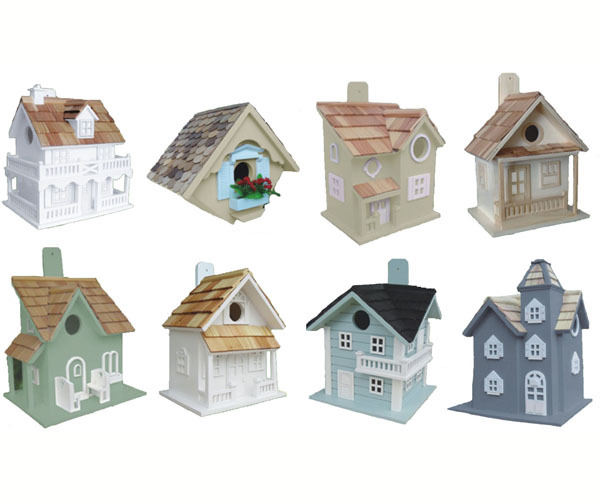 8 different birdhouses in a variety of colors. Each piece comes packaged in an individual box showing an image of the house. Each house features a single chamber, shingled roof and window and door detailing.